I was making my way home later in the day as the clouds were deciding if rain should fall. 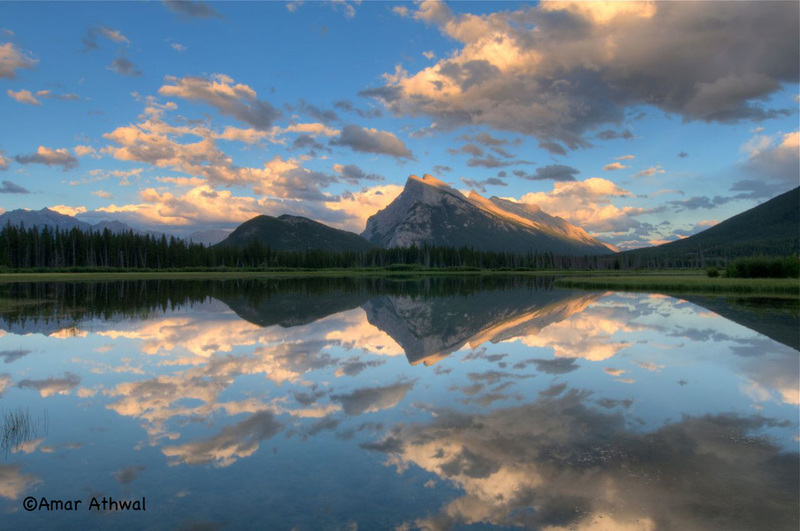 With the debate going on in the sky, the Vermilion Lakes were calm as I saw them from the highway. Late dinner would have to wait, it was time to take pictures at the Vermilions. I slowly made my way to the top of the small dock of the first lake, as to not cause any ripples, I wanted to catch the beautiful reflection in the water. I was not along watching the sun setting behind me, one to the left and other to the right were two Bald Eagles. Each safe from my lens reach, we all watched the late sunlight do it's magic as I took one picture after another.